TOMTOP, established in June 2004, a Chinese retail and wholesale online store. They are specialized in video games, computer accessories, mobile phone accessories, clothing, home and garden items, jewelry, media player, car accessories, etc. TomTop has been a supplier to Alibaba since 2006 and enjoys a very good reputation from customers and Alibaba who made it a Gold supplier of the platform. Faced with their success on this platform and thanks to the accumulated experience, they decided to create their own online sales site. The majority of the products on TomTop come from China, however some products can be delivered from the warehouses located in USA. For delivery to the United States from China, packages will be sent by Airmail and arrive within 7 to 15 business days, which is very correct compared to many platforms delivering from China. For deliveries from the warehouse in USA which is recommended for shipments within North America, the packages will be sent by USP or UPS and will take between 3 and 6 working days to arrive. Yes, wherever you are, TomTop will be able to deliver the products to you. FedEx or DHL could in some cases apply a nominal “remote area charge”. This is very rare, but it can happen when your delivery address is too far from the main logistics centers. If the products are marked “free shipping“, then you will not need to pay for the shipping costs. Shipping is free worldwide. For products without “free shipping”, prices vary according to product, location, shipping method and warehouse. You can check the cost on each product page. 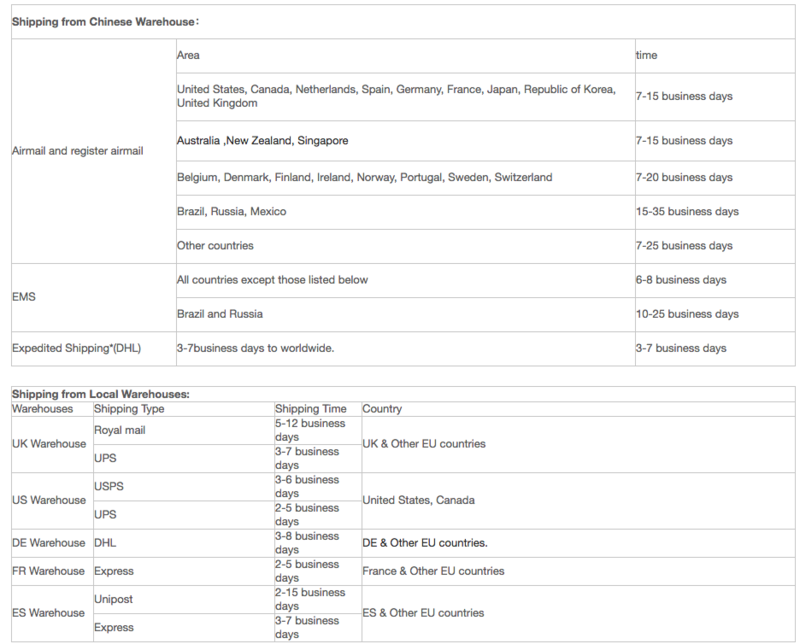 Make sure you have selected the correct shipping country in the “Ship To” tab at the top of the page. You can track your order both during order processing and when it leaves the warehouse. You can check the status in the “My Orders” page of your TOMTOP account. Once your order has been shipped, you will receive an email from TomTop. In this e-mail you will find the tracking information of your packages as well as the website on which you can trace your order. Tracking information is also available on the “Order Details” page. All warranties commence from the date of receipt of the product. If a product generates a defect during the warranty and the fault is due to a quality problem rather than your own breakage or misuse, the return will be accepted. 12 months Manufacturer’s warranty for defective items. Categories included: LEDs and flashlights, Computers and networks, Cameras and photo accessories, Musical instruments, Car accessories, Video accessories, Beauty and health gadgets, Game accessories and other electronic products, etc. Unfortunately, some categories have no guarantee, such as: jewelry, wallpapers, embroidery, decorative paints, bedding, bath, textiles, paper mills. Sports accessories usually have 2 months warranty. Defective items must be returned at your expense within the warranty period and in the original packaging, if possible. You must indicate what is the defect and give your order number, and do not forget to take photos to provide maximum proof! Tomtop will refund or replace the product as soon as the problem is confirmed. TomTop’s customer service is very responsive and understandable, it is easier to communicate with them in case of problems than with some sellers on Aliexpress ( Read our Aliexpress Review). In addition, there are very few problems with your orders via TomTop, they are very professional. However, some flats are to be emphasized. If you don’t really speak English, although the site is all in French for example, it will be necessary to speak a little English if you have to contact the after sales service. In addition, it is regrettable that the fact of return is your responsibility and that TomTop do not offer a direct refund of these costs. Have you been shopping on this site recently? What is your opinion on TomTop? Feel free to share your experience in the comment list below! Your TomTop experience would benefit everyone!